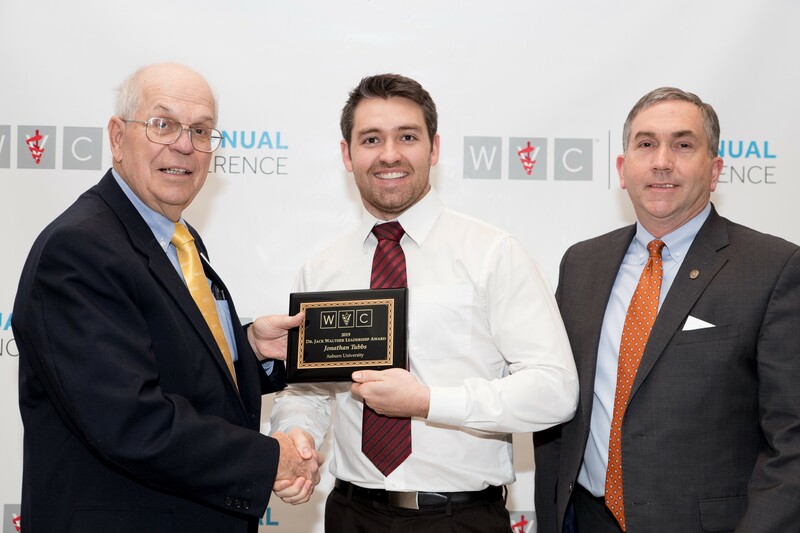 Jonathan Tubbs, center, of Oakman, Alabama, and a member of the Auburn University College of Veterinary Medicine Class of 2020, is a recipient this year of the Dr. Jack Walther Leadership Award, presented during the 91st Western Veterinary Conference, or WVC, in Las Vegas. With Tubbs is Dean Calvin Johnson, right. Presenting the award is Dr. Darwin R. Yoder, Past WVC President. Jonathan Tubbs, of Oakman, Alabama, and a member of the Auburn University College of Veterinary Medicine Class of 2020, is a recipient this year of the Dr. Jack Walther Leadership Award, presented during the 91st Western Veterinary Conference, or WVC, in Las Vegas. The WVC is a flagship event that brings together more than 15,000 veterinary professionals and students for four days of education, innovation and collaboration. The Dr. Jack Walther Leadership Award recognizes veterinary students who display leadership values at their school. This award is given to 37 CVM students who attend American Veterinary Medical Association-accredited universities and are actively involved and show leadership potential at their veterinary college or school. Tubbs served as chapter past-president of Auburn’s Student American Veterinary Medical Association, or SAVMA, as well as past president of the Auburn student chapter of the American Association of Swine Veterinarians. He also serves on the SAVMA National Executive Board. The award includes a $1,000 stipend and covers Tubbs’ participation and travel to the conference.